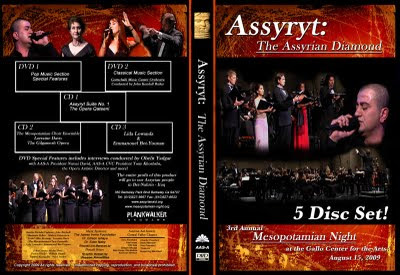 Finally after four months of hard work by the MJC film department the DVD for Mesopotamian Night 2009 was sent for production and will be released soon for Christmas. Below is the cover for this new and unique product. We decided to provide all three CDs and two DVDs from the event in one set. This product is a must have in all Assyrian households. The pricing and order information will be posted soon.